Very disappointed with the park. There seemed to be an event in town and they were basically full, but were able to provide a spot in what was referred to as the overflow spot We asked while we were on the phone if the overflow was an actual spot that would be safe and good access. We were told it was perfectly fine. Upon arrival we were put in a spot that was actually in the roadway. When we questioned why we would be put where we would be stepping out of our Rv into the road we were told cones were going to be put up to block traffic. Feeling uncomfortable about the situation we decided after approximately 5 minutes that we could not stay there. We were told that there would not be a refund given and that our card would be charged. A simple solution is to tell customers that you are full and do not put anyone in unsafe conditions. Very disappointing to see a park conduct business this way after traveling 6300 miles and having the opportunity to stay in so many wonderful parks. 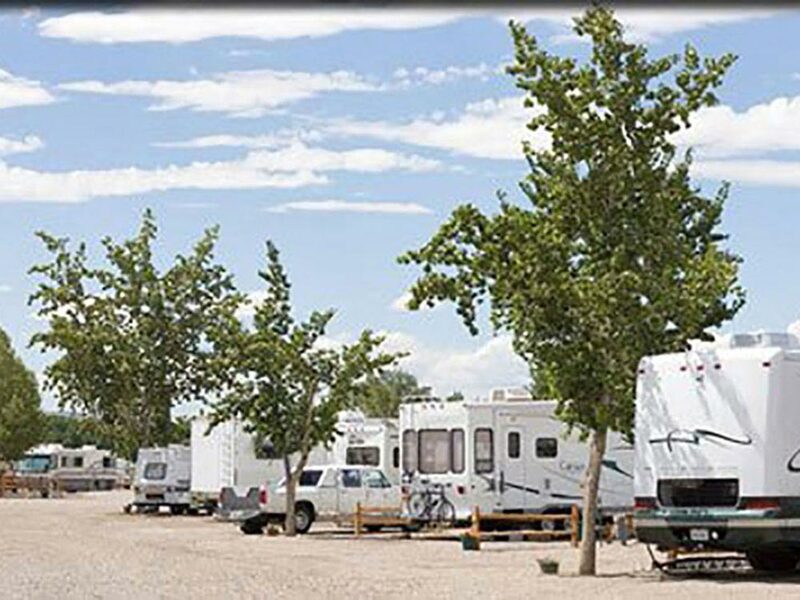 We really appreciate the facility and staff at Junction West-they make it a great place to camp as a well as to store an RV. Because our primary residence is in a winter resort, we store our 40' toy hauler at Junction West so we can get out in the winter if we want to. The storage area is secure and monitored by staff. It is laid out to be easy to navigate, even with a big, long 5th wheel. However, if you want and extra spotter to help you store or retrieve your RV they are always happy to help. In addition to storing at Junction West we also spend 15 to 20 nights camping there each year. It's not a fancy resort-type campground (the sites and driveways are gravel) but its clean gravel and always well maintained. The sites are wide, flat and level and are easy to get in and out of with a long 5th wheel. The staff takes good care of the grounds and landscaping and is always friendly and helpful, including filling and returning your propane bottles if you just set them in front of your RV. I especially like that the owners live on-site and are involved in the operation every day-it shows. The park is convenient to fuel, retail, and services, but it is pretty quiet with just typical sound levels for a rural/light industrial neighborhood. We stay in lots of RV parks every year and I wish they were all as good s Junction West. We arrived at this campground Monday 10,2,2017, apparently after a rain. We made reservations earlier that day, but arrived after hours. The spot we had to use was a large pond. It was the only spot in the park in the pond in the middle. I had to hook up in two or three inches of water arounf the trailer. The next morning, the clerks were apologetic, but my feet are still wet and cold. They need to grade better. Bathrooms are very large and clean and warm, though. We made a reservation online the night before arrival, received a confirmation yet on arrival, they did not have a space that was requested - they were full. Rather than calling to explain the situation, and in an attempt to "upgrade" us at no extra charge, we were assigned to a spot that was too small. We have a 35ft 5th Wheel and we were placed in a space for a 27ft C Class with 30 amp service rather than 50 amp. The connections for any rig were ridiculous - the cable TV needed to be stretched completely taught, the water was all the way behind the unit and the electric was all the way to the front - what kind of set-up is this? In addition, we were placed next to a "tenant" that looks like he has camped there for some time. He has 2 sheds that are falling apart and all kinds of junk and machines of various sorts cluttering around the entry and front of his travel trailer. When I went to the office to complain, the lady on duty did call the owner. She tried to explain they had no control over the reservation website and she admitted she made the error for reassignment and the type of unit being considered. She offered to put us in overflow, or call another park to see if they had room, or give us store credit. The problem was, after traveling all day, finally getting unhooked and settling our cat, moving was the last thing we wanted to do especially since we couldn't get what we originally requested.. Besides, we were only staying one night, and unfortunately, one night is probably all it will ever be. My suggestion if you are going to consider this park would be not to use the website, but call and actually talk to a person to see if they have a space for you. If you need WIFI it is one step up from Dial Up. .47 Mbh was the best download speed I could get at 6 AM.Forget any streaming. I was their one night but it seemed like two days. Sales associate very helpful. We had a fifth wheel with an extra jeep with a boat and trailer and were given a site to fit. Pet friendly with a play area. The park is located west of the main Grand Junction area and sits off a main street for truck traffic although it wasn't noisy. Convenient location freeway exit 457 go 1 mile south. Easy acess in and out. Very helpful and courteous office. Late arrivals welcome. Only stayed one day. Large pull thru. Good elec. service. Office personnel very friendly. They have cable service but doesn't include local channels must use antenna to get local channels. Would stay here again. The good reviews of this campground surprise me. We found it to be convenient to highway, truck stops, and markets/stores, with friendly staff, but very unappealing. It is in an industrial area. The gravel is clean, so you are not going to track dirt into your unit. We had a pull through site but it was challenging to navigate, and the length is very tight for a 40 foot motorhome-towing. The tiny dog walk is just awful: all gravel, and overall there is very little greenery in the campground. I can't imagine staying here longer than one night, but there are plenty of long termers. As a final bad note, we woke to the noise of the compressor of the truck that drove around to clean RVs. A nice service, but this really adds to the industrial atmosphere of the park.